I am a 45 year young active male. I play basketball about 4 times a week in 3 different leagues. 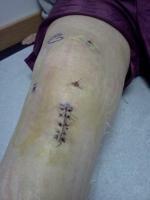 On Dec. 28th I injured my knee pretty bad. After a visit to the orthopedic she felt I only had a grade 2 sprain. Revisited after 3 weeks and she thought I was progressing as I should be after that amount of time. With being as active as i am I still requested an MRI. So after they told me it takes about 3 days for results, 4 HOURS later I had a message from the doc. Torn ACL/MCL and meniscus ligament. I head to the surgeon Wednesday for scheduling of surgery. As many have said in the stories above I am freaked out/nervous/scared. I can't imagine not playing ball at the same level I do now.